For those just joining us, I decided to map out a chronology of the history of the WildStorm Universe. A “beloved” part of the Image Comics group in the early ’90s. This week I’m covering four issues of their flagship title “WildC.A.T.s” which featured the eternal war between two alien races, the Kherubim, and the Daemonites. Not that these issues advance any of that story at all. Well, the rest of the team is busy. See, Wu got a hold of Jacob and Jacob goes to meet Wu alone. While this is happening, Raksha possessed Priss convinces the team that Wu is trouble and that they need to go save Jacob from him. So Void teleports the team to where Wu and Jacob are and they’re suddenly under attack from the Troika (Attica, H.A.R.M., and Slag) who are joined by Void Jr. AKA Providence. It’s all a set up by the true villains of the story, Tapestry and Lord Soma. They hired the Troika, who I guess brought Providence along for the hell of it, and are quite pleased with to see a Raksha take over one of their enemies already, Priss. Ok, back to the main action, Tapestry has royally messed with all of the WildC.A.T.s she can get her hands on, in one way or another, and they’re all beholden to her. To stave off become a Raksha, Zealot unleashes the powers that she learned from Tapestry in their shared history (more on that later.) So now Zealot has frizzed out hair and wields the same ability to rewrite souls/back stories (or what have you) that alsoTapestry wields. Savant and Mr. Majestic show up and they are not having it! Hell, even Zealot knows is pissed that Savant took too long to get there to help her, and she had to manifest this unknown power. Hell, Zealot used it to take down Slag! While Savant, Mr. Majestic, Zealot and Huntsman are sitting around arguing, Zealot realizes that H.A.R.M. had been taken out, too! Turns out, that was thanks to our old buddy Cole, back from Chicago! Yay, Cole! 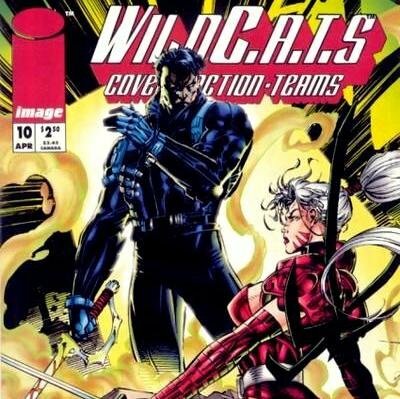 If you’re into the WildStorm Universe, or just want to see what it is all about, click on over to weatheringwildstorm.wordpress.com which features a complete chronological “order” as well as several past entries large and small showing the connections of these books to one another.